In upstate New York, just under 90 minutes' drive from both Buffalo and Syracuse, the city of Rochester celebrates Christmas with a good number of indoor and outdoor events. The Visit Rochester tourism board says, "Winter means plenty of snow for enjoying winter sports, ice-skating, skiing, sledding and more." Twirl and glide on the ice beside a 30-foot Christmas tree at one of Rochester's popular skating rinks. This is where everyone gathers to see the Liberty Pole, the city's most recognizable landmark, illuminated to mark the holiday season's start. Lighting of the Liberty Pole is an annual ceremony held on the first Saturday of December at intersection of East Avenue, East Main Street, and Franklin Street. Children get a first glimpse of Santa Claus with his reindeer and elves, while a parade, fireworks, and ice skating round out the family event. The run up to Christmas means artisan crafts fairs as well as Christmas strolls in several of Rochester's neighborhoods. For mall-going shoppers, Santa Claus is coming to town and serving milk and cookies too at The Marketplace Mall. Holidays at the Market features dozens of vendors displaying art, crafts, decorations, holiday food delicacies, gifts, stocking stuffers and more at the Rochester Public Market, founded in 1905. Take a free horse-drawn carriage ride with Santa, decorate a free holiday cookie, and browse a wide selection of holiday trees, wreaths, and fresh garlands in this historic location. Since its beginnings in 2013, the annual Brainery Holiday Bazaar brings more than 40 regional vendors together for a two-day pre-holiday shopping event featuring unique artisan gifts. Complete with DIY gift wrapping stations and a raffle for locally curated gift baskets, the bazaar is held in a modern community space with an industrial vibe at 176 Anderson Avenue in Rochester's Neighborhood of the Arts. A tradition since 1970, the annual Holiday Bazaar Arts & Crafts Sale features more than 200 fine artists and craft vendors including ceramics, jewelry, glass, woodwork, photography, paintings, prints, sculpture, fiber arts and floral crafts. 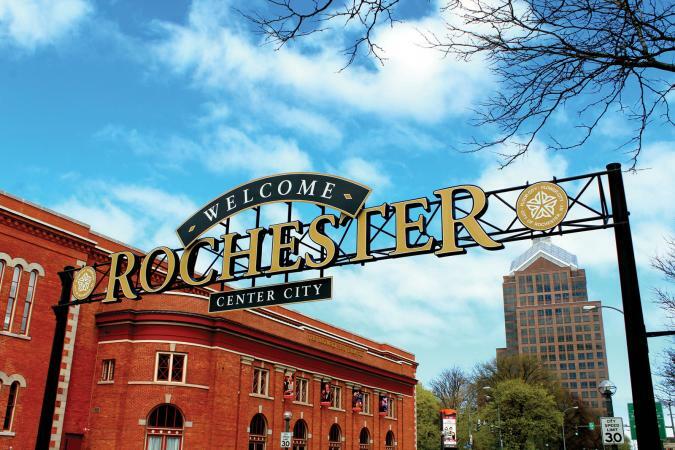 As one of the longest running arts and crafts festivals in the Rochester region, it attracts thousands of shoppers to the Rochester Museum & Science Center during the week prior to Thanksgiving. One of Rochester's most picturesque neighborhoods is dressed up in holiday cheer for Park Avenue Holiday Open House on the last Thursday evening in November. More than 80 businesses participate in an evening open house, providing free entertainment, horse-drawn carriage rides, roasted chestnuts, and holiday characters to pass out candy cane treats to the children. 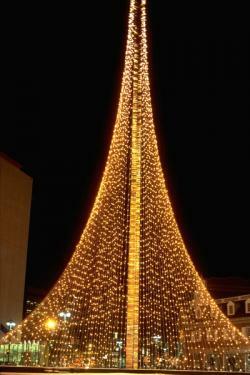 Sparkling lights decorate buildings, tree branches, bushes, and light poles at major intersections. The trendy South Wedge neighborhood also throws a daytime holiday celebration on the first Saturday of December. Known as "It's a Wonderful Life in the South Wedge: A Handmade Holiday," there are holiday art and gift vendors, horse and carriage rides, live musical performances, holiday-themed games and food trucks in streets decorated with pine boughs and ribbons. Vendors spread their goods at a market in the Historic German House and St. Boniface Church located at 315 and 330 Gregory Street. Children get into the spirit decorating Christmas stockings and making tree ornaments. Scrooge meets the ghosts of Christmases past, sugar plum fairies dance, and voices lift to sing the Hallelujah chorus in traditional cultural programs for the holidays. It's a Rochester family tradition for the holidays. 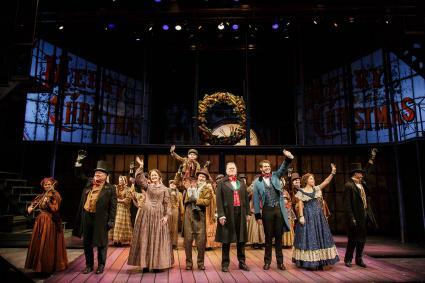 The Charles Dickens classic A Christmas Carol is performed onstage at Geva Theatre Center from Thanksgiving through Christmas Eve. This two-hour show is recommended for ages 5 and up. The Rochester City Ballet performs Tchaikovsky's The Nutcracker in late November, accompanied by the Rochester Philharmonic Orchestra. There are more opportunities to see The Nutcracker, presented by The New York State Ballet, the Lyric Voices children's choir, and a live orchestra in early December at the Kodak Center for the Performing Arts. Penfield Symphony Orchestra presents the Music to Warm Your Heart holiday concert to include the ever popular Hallelujah Chorus from Handel's "Messiah" in a sing-along. The Rochester Broadway Theatre League presents A Christmas Story, based on the 1983 film and 2013 "Best Musical" Tony Award nominee. Performances are at Auditorium Theatre, 885 Main Street, for a week in mid-December 2017. As Christmas nears, Conductor Jeff Tyzik leads the world-renowned Rochester Philharmonic Orchestra and a 200-voice high school chorale for a festive concert of treasured carols. Performances of the Gala Holiday Pops just prior to Christmas Eve take place at Kodak Hall at Eastman Theatre. The connection between celebrations with the family and capturing the moment has long been a strong one. At Rochester's George Eastman Museum, former home of the Eastman Kodak founder, a number of themed events are popular with the entire family. Other Rochester museums are joining in the spirit with special events of their own. 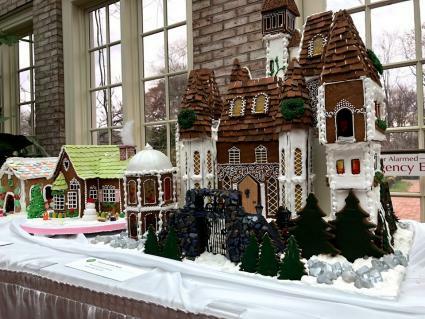 A National Historic Landmark dating from the early 1900's, the George Eastman Museum hosts the annual Sweet Creations event that displays dozens of cleverly decorated gingerbread houses. Visit through mid-December when all the confectionery creations are available for purchase through a silent auction. Tabletop Christmas trees and fragrant wreaths are on display throughout the Eastman house, also auctioned off for supporting maintenance at the historic site. A Holiday Homecoming evening with Santa and a screening of the classic 1946 film It's a Wonderful Life are on the schedule for early December. A fabulous Christmas playlist accompanies a 50-minute Holiday Laser dancing light show against the starry backdrop in the Planetarium at The Rochester Museum & Science Center through New Year's Day. Just 10 miles south of downtown Rochester, hop a Holly Trolley ride at the New York Museum of Transportation in Rush, New York. Operating on weekends through mid-December, it's a spirited ride on a vintage electric trolley through the winter countryside. Departing every half hour, no reservations are required. What could be more appropriate at Christmas? The Strong National Museum of Play has the world's largest collection of toys, dolls, games and video games. Which ones made it into the National Toy Hall of Fame? Visitors can see whether they've guessed correctly and have some fun with interactive play. 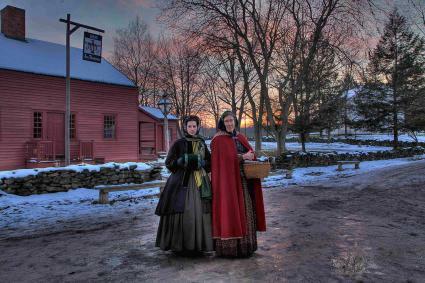 Costumed interpretive guides at a re-created historic village outside Rochester, New York reveal a Christmas of 1849 through storytelling tours for visitors. Twenty-one miles from Rochester, at the Genesee Country Village & Museum in Mumford, Yuletide in the Country Tours is a 90-minute guided walk through a re-created historic village. The setting is 1849 as the villagers begin their Christmas preparations. Visitors observe music, dancing and family traditions of the mid-19th century, such as lighting the Christmas tree. Daytime tours allow for a beautiful afternoon walk through the village while nighttime tours offer a serene lantern-lit walk on weekends during the month of December. At the Genesee Country Village & Museum, kids can stir a hot chocolate with candy canes when Breakfast with St. Nick takes place in late November. During Yuletide in the Country Tours, a Yuletide Buffet is served in the museum's Banquet Center, all decked out for Christmas. Events are catered by Caledonia Village Inn, a landmark restaurant serving French American cuisine in a historic property. Greater Rochester has a good mix of moderately priced chain properties as well as historic properties oozing with character. From the airport to the shores of Canandaigua Lake, visitors will find amenities and features from Wi-Fi to free parking and fireplaces to free breakfast. The Inn on Broadway is a stately property, formerly the University Club founded in 1909, with 25 guest rooms. Located right next to the George Eastman Museum, there's free continental breakfast, Wi-Fi, and parking. The popular Tournedos steakhouse features an award-winning wine cellar of 550 curated bottles. With a fireplace in the dining room, the 1905 Dartmouth House is a six-room upscale bed-and-breakfast in the tree-lined Park Avenue neighborhood near downtown. Free amenities include parking, Wi-Fi, and a full breakfast. At Edward Harris House, chandeliers and chintz contribute to the charming Victorian character of this 1896 home converted to an urban inn in Rochester's arts district. There are eight bedrooms upstairs, fireplaces downstairs in the lobby, library and dining rom where complimentary breakfast is served. Rochester, New York embraces the year-end holiday season in upstate New York style. Twinkling lights, a chill in the air, and a crackling fireplace are never far from whenever you may find yourself as you explore the options and diversions for visitors.